Throughout much of the US, markets are loaded with Brussels sprouts right now. That’s because these little buds reach their peak when the weather turns chilly. Once they’ve been kissed by frost, their flavor seems brighter and their texture even crisper. What to do with all this bounty? Make a hash of it, we say. 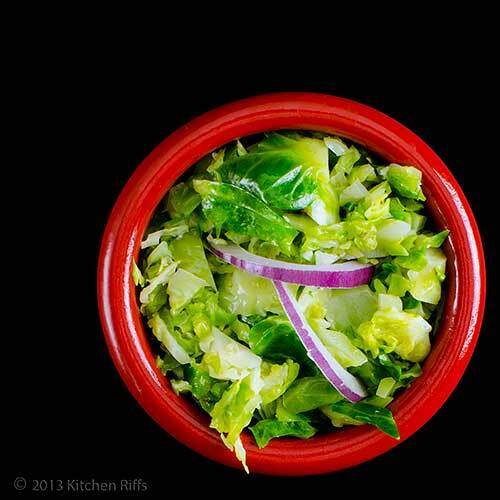 Hashed Brussels sprouts are easy to make, and their flavor can entice even the most cabbage-avoidant. Plus, you can do most of the prep work ahead of time, then quickly finish them right before serving. Perfect for a big, multi-dish dinner (like Thanksgiving, just to mention one example). Still worried that some guests will balk at eating this much-maligned vegetable? Just tell them you’re serving a great new French veggie called choux de Bruxelles. They’ll eat it up. To make this dish, you just clean the Brussels sprouts and parboil them for a few minutes. Then drain and “hash” them (i.e., cut them up with a knife). You can do these steps hours—even a day—ahead of time. Then just before serving, warm the hashed sprouts briefly in melted butter to finish the dish. Simple. Parboiling (that is, quick cooking followed by immediate cooling in ice water) locks in green veggies’ flavor, color, and nutrients. Those dull, grey Brussels sprouts you’ve seen? Overcooked. No chance of that happening with this recipe. There are several methods for making hashed Brussels sprouts, but this is the easiest one I know. My recipe is lightly adapted from one I found in Julia Child’s The Way to Cook. Prep and parboiling time for this recipe is 20 to 30 minutes (depending on whether you hash the Brussels sprouts by hand or use a food processor). When you’re ready to serve, you just need to heat the cooked Brussels sprouts in melted butter—another 3 or 4 minutes, tops. 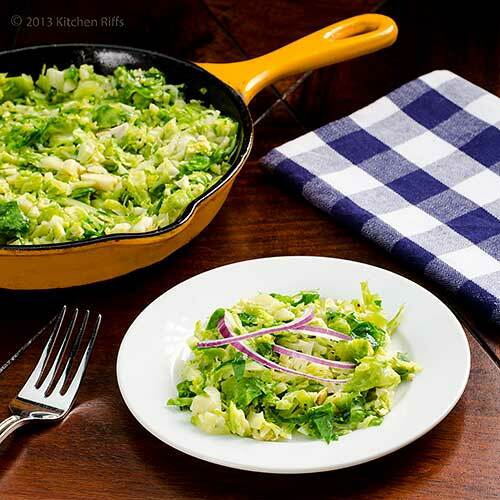 This recipe makes 6 to 8 side-dish servings, and you can easily scale it up or down. Leftovers keep in the refrigerator for a few days if stored in an airtight container. Wash and drain the Brussels sprouts. Remove any loose or discolored leaves. Cut off the stem end of each Brussels sprout as close to the body as you can, without detaching leaves. Cut a cross a bit less than ½ inch deep in each stem end (this helps promote more even cooking). Bring water to a boil in a large cooking pot—use at least 4 quarts of water (preferably 6). Once the water is boiling, add salt (2 tablespoons for 4 quarts, 3 tablespoons for 6). Add the prepared Brussels sprouts to the water. When the water returns to a boil, cook for 4 minutes. At that point, test a Brussels sprout—it’s done if you can insert the tip of a paring knife into the sprout fairly easily. If not done, boil another minute or two (but don’t overcook!). When done, drain the Brussels sprouts, then place them in a large bowl filled with cold water and ice cubes (a tray or two of cubes) to stop the cooking process. When the Brussels sprouts are cooled (this will take a few minutes), drain them. Spread the Brussels sprouts on a kitchen towel or on paper towels to dry. Once the Brussels sprouts are dry, use a big knife to chop them until they’re as fine as you want (larger pieces will take longer to warm up later). If you’d prefer not to use a knife, you can instead pulse the Brussels sprouts in a food processor—but be careful not to over process (which will quickly turn them to mush). Place the hashed Brussels sprouts in an airtight container and refrigerate until ready to serve (later the same day, or the next day). When ready to serve, heat a large skillet over medium heat. Once the skillet is hot, add butter. When the butter has melted, add the hashed Brussels sprouts and season with salt and pepper to taste. Sauté the veggies until they’re warm and cooked to the degree of doneness you prefer—I like them a bit crunchy, so about 2 minutes is enough for me. For softer Brussels sprouts, cook a bit longer (they may start to brown a bit). Adjust seasoning and serve. An optional garnish of raw red onion slices adds festive color and a nice flavor contrast. I prefer to use smaller Brussels sprouts rather than larger ones (I think the flavor is slightly better). But whatever size you buy, make sure the heads are firm when you squeeze them; avoid any that are soft. You should also avoid Brussels sprouts with yellowed leaves or too many loose leaves. If you live in an area that sees cold weather, it’s best to buy locally grown Brussels sprouts after your locale has experienced several frosts (because frost seems to sweeten Brussels sprouts, making them even more delectable). Brussels sprouts shipped in from warmer climates probably will not have been exposed to frost. You can replace all or part of the butter in this recipe with extra virgin olive oil. But butter has better flavor in this dish, IMO. If you like, you can also add half a cup or so of heavy cream to this dish. Right before you remove the Brussels sprouts from the skillet (Step 6), stir in the cream, then heat until warm. This version of the dish is definitely not diet fare, but it’s awfully good. I don’t think this recipe needs seasoning beyond salt and pepper. But feel free to add your favorite herb if you like (thyme would be our choice). I’ve seen more elaborate recipes for hashed Brussels sprouts that add poppy seeds or black mustard seeds, along with lemon and garlic. Sounds interesting, but this basic recipe is so good we haven’t felt the need to tinker with it. The raw red-onion garnish is strictly optional. It adds nice flavor and looks pretty, but this recipe is also great without it. If you really like red onion, you can cook some and add it to this dish—it goes nicely. Simply dice a medium red onion, then add it to the melted butter at the beginning of Step 6 before you add the Brussels sprouts. Sauté the onion until it’s soft (about 8 minutes), then add the Brussels sprouts and proceed with the recipe. BTW, if you go this route, you’ll probably want to increase the amount of butter you’re using by a tablespoon. You can hash almost any veggie you can think of. This method also works particularly well with broccoli. “And to think I used to hate Brussels sprouts when I was a kid,” I said. “Yeah, we could turn it into an action flick!” I said. “Too bad Daniel Craig is occupied with other projects,” said Mrs K R.
I'd pay just to see Daniel Craig eating a Brussels sprout! Great recipe. Simple, which is just what everyone needs on the T-Day. I hated them also, when I was a kid. What happened? Hi Abbe, people don't overcook Brussels sprouts so much these days so I don't know if kids still don't like them. But they may - I read somewhere recently that kids are much more sensitive to bitter flavors, and Brussels sprouts - particularly when they're overcooked - are a bit bitter. As we get older, our tastes change and bitter is better! Thanks for the comment. Nice recipe! We don't eat Brussel Sprouts that often but you're definitely changing my mind and thinking more about trying these puppies again. Hashed Brussel Sprouts must be the thing right now since I just saw another posting on it this morning. You may convert me after all. So...to make sure you know this is not meant to be a message from an evil troll I did take the time to read the recipe and you have redeemed yourself sir...a couple of minutes? Sure. Still crisp? That too. Whew! Gotta say this sounds yummy. I'm totally in love with the sprout! They look divine! Definitely on my must make list. I love brussel sprouts.. I haven't cooked them in butter, but soooooo so yummy Asian style. I love the simplicity of this recipe. The bright color is amazing. Definitely will try this one. I bet brown butter would be really good. Hi Nazneen, that's what Mrs K R thinks! Hi VIcki, Brussels sprouts done this way are excellent - I've not yet met a "hater" that wasn't at worst neutral about this dish, and most really enjoy it. Thanks for the comment. Hi Barb, perhaps I ought to make clear in the recipe headnote that the parboiling time is short short short! ;-) This really is a good recipe - I think you'd enjoy. Thanks for the comment. Hi Nazneen, I've come to like most Brussel sprouts recipes, but this one and roasted are my two faves. Thanks for the comment. Hi Sowmya, you'll really enjoy this! Thanks for the comment. Hi Winnie, this would be a great main dish. You could also mix in a few roasted nuts just to amp u the nutrition a bit. Thanks for the comment. Hi Honey, I like Brussels sprouts Asian style too - I often stir-fry with them. Thanks for the comment. Hi Chris, brown butter would be outstanding, and I've done that before. Thanks for the comment. I know Brussels sprouts and I eat them. My mother loves them as well and we used to eat them when I was a child. But this is new. I don't know how but somehow we never came up with this idea. hahaha. Good one, thank you! This hash is for sure much better for my hips than the traditional potato one. Love it! Hi Nee, you'll love these! Really a terrific dish. Thanks for the comment. Hi Marta, this is such a fun way to use them! And they taste delish. Thanks for the comment. Hi Denise, other than the butter, this is a pretty light dish. And has a wonderful flavor! Thanks for the comment. Hi Uru, you really should give this a try - the flavor is terrific! Thanks for the comment. Hi Kumar, isn't this nice? Great color and better flavor! Thanks for the comment. I didn't grow up with brussel sprouts but started loving it after I got here. A very nice of enjoying this vegetable. It would be so good with our thanksgiving meal. IT's fresh and so colorful, love it. Hi Carolyn, this recipe really does convert a lot of people who dislike Brussels sprouts. The flavor is so good! Thanks for the comment. Hi Asha, this dish is made for Thanksgiving! Great flavor, and it takes just a few minutes before serving to finish it. Thanks for the comment. Hi Julie, bacon makes most things better, doesn't it? ;-) Thanks for the comment. Hi Gayathri, it is delicious, it is! Thanks for the comment. Hi MJ, when I get going on a food, I do tend to overdo it, don't I? ;-) Both recipes are delish. And what until you see what I do with the leftovers of this dish! Thanks for the comment. You've made sprouts fresh and interesting again, thanks! What a lovely side dish!! I am a brussels sprouts convert :) Just learned to like them recently! My daughter turned me on to brussel sprouts a few years ago. I can't get enough and am always looking for new ways to use them in my kitchen. A great idea! I do that occasionally. Another fantastic idea for brussels sprouts!! Thank you very much for sharing this post! Hi Lizzy, isn't this a nice recipe? Quite simple, and totally delish! Thanks for the comment. 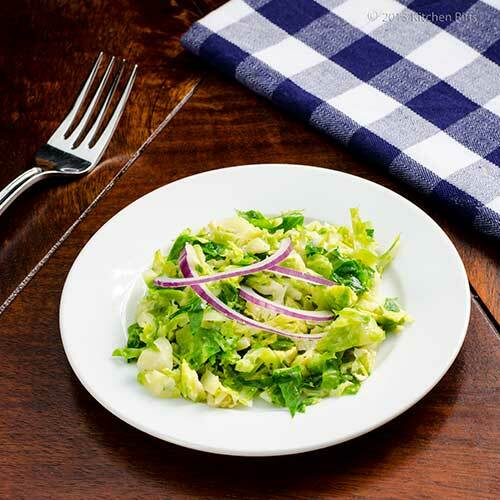 Hi Ashley, if you're new to liking Brussels sprouts, this dish is for you! Thanks for the comment. Hi Charlie, the beauty of parboiling green veggies briefly then immediately cooling them in cold water is they retain their vibrant color. A lot of restaurants prepare their veggies this way. Then when they get an order, they finish them right before plating. Thanks for the comment. Hi Paula, it does look a bit like lettuce! That's because when I hash Brussels sprouts, I like fairly large pieces. You can also mince the Brussels sprouts, although I prefer my food to have a bit of texture. Thanks for the comment. Hi Maureen, isn't this easy? And quite tasty, too. Although anything with butter is awfully tasty! Thanks for the comment. Hi Bellini, welcome to the Brussels sprouts club! Aren't they a nice veggie? You'll enjoy them hashed. Thanks for the comment. Hi Rosa, isn't this a great way of preparing Brussels sprouts? I don't do it often, but every time I do, I wonder why I don't do it more frequently! Thanks for the comment. Hi Dan, one can't have too many Brussels sprouts recipes! Thanks for the comment. Hehe...choux de Bruxelles...my mother in law would eat that up actually! I love this idea. I'm one of the few in the world who likes brussel sprouts so I'm glad to see them cooked in a different way other than the usual roasting (which is good, don't get me wrong). Hi Tina, roast Brussels sprouts are great, but I think this dish is even better. But I'd happily eat either! Thanks for the comment. I'm making sweet potato Brussels sprout hash for dinner tonight! I don't par boil the sprouts though. No matter what I'm doing with them, I find they tend to get overcooked. I love the simplicity of this dish, John. Although, the addition of cream sounds mighty tempting too:) Many recipes for Hashed Brussels Sprouts have some intriguing additions, (I may give those with fennel a try one day) but, I just adore "frosted" brussels sprouts which are quite abundant here in PA due to the chilly weather. Simply cooked and savored sounds good to me! Butter makes everything taste good, even the Brussels sprouts! I love the simpleness of this dish and it can be prepared ahead of time. Nice job! Hi Laura, that sounds like a fairly long-cooking hash - I wouldn't parboil them either. Sounds delish - what time is dinner? ;-) Thanks for the comment. Hi Louise, you certainly can do an awful lot with this dish to fancy it up! The addition of fennel sounds wonderful. Thanks for the comment. Hi Holly, butter is good stuff, isn't it? ;-) This really is a good dish, and I'm with you on liking that it can be made ahead. Thanks for the comment. Every time I walk into my local grocery store, these guys are staring me in the face saying "buy me, cook me!" Thanks for this great recipe!! Hi Kristi, those guys would love to be hashed! ;-) Thanks for the comment. I just love that these can be made ahead of time. PERFECT for T-day. We're planning our meal now, and this has just been added to the list! Thank you for sharing. A delicious end to a long Thursday! I hope you have a wonderful weekend! i must try out your recipe, the last time when i cooked Brussels Sprouts, everybody hated it. Hi Monet, isn't this a nice dish? I think you'll enjoy it. Thanks for the comment. Hi Cquek, I'll bet they'll enjoy this version of Brussels sprouts! Really good stuff. ;-) Thanks for the comment. So vibrant and fresh!! I love the simple preparation of brussels sprouts. Makes it even more delicious! I think people who *think* they don't like brussel sprouts just have never had them prepared well. This is a great way to convert anyone to a fan! Looks delicious! I think I would love the version with cream poured over at the end! How pretty this dish is and would be great at Thanksgiving and Christmas for a change from the nasty boiled version that is usually served up! Very colorful and quick too! Hi Kiran, food simply done is often the most flavorful! Thanks for the comment. Hi Amy, I agree about people who don't like Brussels sprouts not having had them properly prepared. Thanks for the comment. Hi Barbara, the cream addition is really nice. But really rich! Thanks for the comment. Daniel Craig in Revenge of the Brussels Sprout would be priceless! The hash you created is inspired, John. Brussels sprouts have become one of my favorite veggies, too, and this is such a nice twist. Thanks for sharing and happy Friday to you! Te han quedado exquisita y ademàs es saludable un encanto de receta,abrazos. Hi Hannah, wouldn't that be a fun movie? ;-) Happy Friday to you, too, and thanks for commenting. Hi Caroline, it really is! ;-) Thanks for the comment. Hi Rosita, this really is such a nice recipe. Super good! Thanks for the comment. you had me at "make-ahead," john. I myself LOVE brussels sprouts, endlessly, but i have plenty of people coming over for thanksgiving who are cabbage-averse. No longer, hopefully, if i make this. Lovely, thank you. Hi Shannon, making stuff ahead really helps reduce chaos, doesn't it? I'll do it any time I can. I've had good luck with the cabbage-averse and this recipe - hash it fine enough, and they won't know what they're eating. ;-) Thanks for the comment. It's amazing how tastes change as we grow older. I would never have touched brussels sprouts until a few years ago, now I love them cooked or raw in salads. I made roasted Brussels sprouts after I found them on your blog. Now seeing this recipe you have my interested peeked again about Brussels sprouts. I will have to find some at the grocery store and try this, it sounds delicious. Hi Kristi, it is interesting how our tastes change, isn't it? Properly prepared ones are wonderful! Thanks for the comment. Hi Dawn, I can't decide whether I like the roasted or hashed recipe better! You'll like this - wonderful flavor. Thanks for the comment. Haha, choux de bruxelles, I bet that would actually work on some people! This does sound like a very tasty recipe though! Hi Irina, I hadn't thought of that, but this dish is somewhat similar. And honestly, it's so good it could almost stand on its own! Thanks for the comment. Hi Yvonne, :-) It is a really tasty recipe - one worth keeping in mind. Thanks for the comment. This is one of my favorite ways to eat Brussels sprouts but I haven't made them this way in a while. Thanks for reminding me! So simple and quick. They'd be a great addition to the holiday table. Hi Bill, before I wrote this post, it's been years since I've made them this way, too! I don't know why, because I'm reminded about what a great recipe this is. Too much stuff to make, I guess! Thanks for the comment. wow, look at the color, you've just successed on blanching the brussel sprout! Hi Dedy, I really love how this method preserves the color of Brussels sprouts! And the flavor is great, too. ;-) Thanks for the comment. So much time, passion and love went into describing, preparing, taking pictures of just a bunch of Brussels sprouts! Just some good old Brussels sprouts! Thanks ton for the picture perfect, crunchy recipe. Hi Nusrat, don't you love taking an ordinary everyday food and making it special? This recipe sure does that! Thanks for the kind words, and comment. Hi MJ, although I really like my own recipe, it so delights me when others adapt them and make them their own! And I'm particularly happy that Brussels sprouts are appearing on your table! Give them a chance -they're a great veggie! Thanks for the comment. Hi Amy, this is really good - I think you'll like. ;-) Thanks for the comment. Hi Raymund, it's a really terrific dish - very simple, direct, and fresh flavor. Thanks for the comment. This is a new way to cook Brussel sprout as I never boiled it before cooking. It sounds pretty simple and I want to make this next time. Love the beautiful color - different from roasting or stir-fry, and it looks a lot healthier! Hi Nami, briefly boiling Brussels sprouts works really well. Boiling them to death (as too many of our mothers did) is disaster! This is totally worth trying - I think you'd enjoy this recipe. Thanks for the comment. Can't wait to try this dish. Always looking for ways to prepare Christmas lunch in advance and to improve on the old boiling to death of Brussels! Hi Simone, this is a great recipe! One of the best ways to make Brussels sprouts I know. Thanks for the comment. Dude you are a genius. I love this idea. You never cease to amaze me. Hi Kim, this is really good stuff! Definitely worth trying. Thanks for the comment.